So, you're looking for advice about how to format your multiplayer thread? Or perhaps you'd like to optimize your existing thread to garner more views? 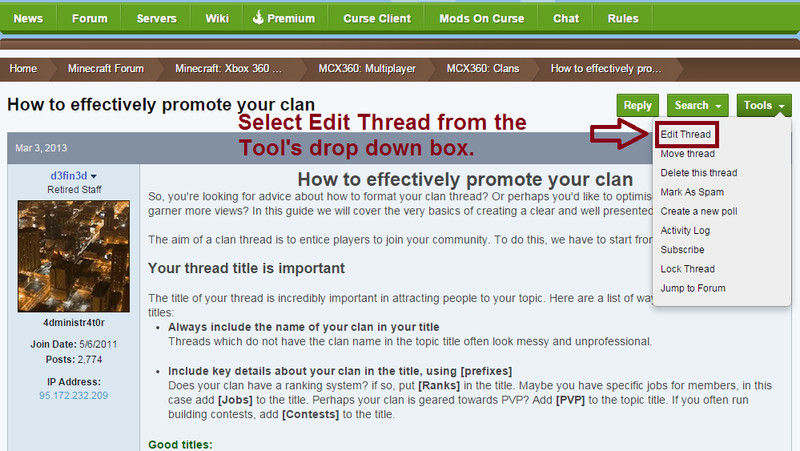 In this guide we will cover the very basics of creating a clear and well presented multiplayer thread. Threads which do not have a clear title often look messy and unprofessional. Are you playing Survival? if so, put [Survival] in the title. Maybe you have specific type of Survival server. Maybe you have factions. in this case add [Factions] to the title. Perhaps your game is geared towards PVP? Add [PVP] to the topic title. If you often run building contests, add [Contests] to the title. If you are looking for friends, staff or need help building something? 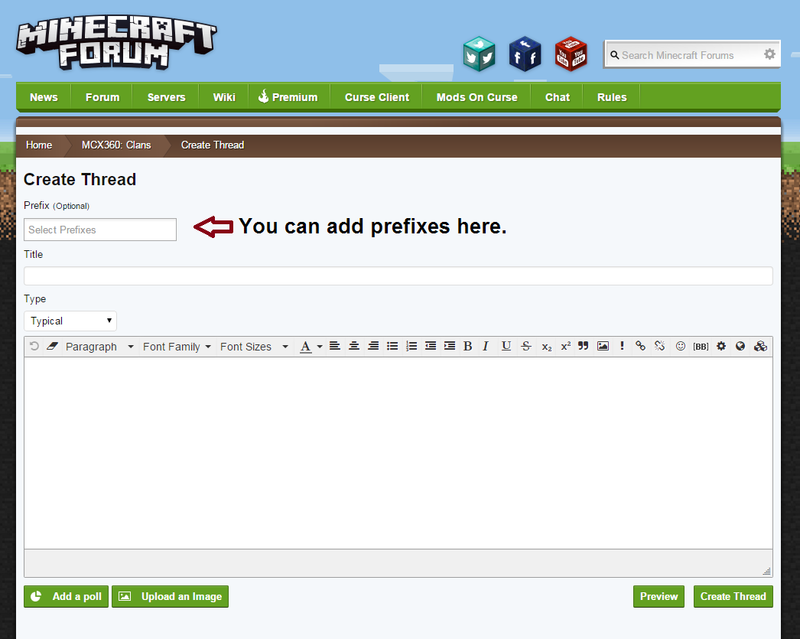 We have [Friends], [Staff] and [Builder(s)] prefixes also. To add Prefixes to an already created thread. Titles which clearly display your game name, or purpose for your thread. Titles which are unclear, messy and non-descriptive. Having either a banner, logo or some form of image at the top of your thread is a big plus. This will be the first thing potential members see and are drawn towards. Images and videos elsewhere in the thread will help a lot too. A short (or long if you prefer) introduction is important to explain exactly what your game or request is all about. If you're focused on PVP and fighting stuff, make this clear in your opening text. If you're more geared towards co-operative building, add this within your introduction. If you need help, let people know exactly what you need help with. Do you have a list of jobs that your game has? If so, this would be a good time to list them. Similarly, if you have a list of member ranks, put them beneath your intro. Being clear about your rules is incredibly important. Display them somewhere in your thread, or you may find people just do what they want. The best way to invite players into your game is to provide them with a list of questions to answer. This helps them know you're serious and helps you know who may soon be a part of your game. Format your threads nicely, but don't overuse bold, underline, excessively large fonts or a crazy amount of colours. Threads which over use text formatting can look messy and amateur. That's it for now. If you have any questions or suggestions about formatting multiplayer threads, feel free to add them as a reply to this thread. Got your info, going to use it. Do you have any additional suggestions for getting more views? I used a lot of the suggestions here already, but feel like more can be done to get a more optimal amount of views. I'm not sure, though. Being able to point out what makes your game unique compared to everyone else's will help. There are a lot of hunger games, survival, creative, factions, and mini games being hosted by a lot of different people. Put yourself in your potential friend's shoes. What would make them choose your game over another random member's game? The forums also has people from all over the world looking. If you post your topic when not a lot of people are generally on the forum, your topic will more than likely be buried in the next few hours. How do you do underline and colors? At this point though, be sure to unclick the U button above so the rest of your text isn't underlined as well. Highlighting the text and clicking the U button again will also remove the underline. Color can work the same way. You could also highlight the text you want and use the colors we have in our editor, though, if you don't see a color you like, you would need to use the codes/names as mentioned in the two examples above. For reasons I don't understand at the moment, to remove color, you can select the Clear formatting button to reset the color back to normal. Be careful though, this will remove any changes to the text you have done to the text. If you have any more questions, I am more then happy to help. You can always add more to your post. If you are starting a post, and you're not ready for members to join, I suggest opening a notepad or similar text document application on your computer to type of what you want first. So I have been creating a bunch of servers lately. Some of them have gotten really old ad outdated. Is there anyway you can delete or close a thread without the help of a moderator? Do people have to be your friend to see your thread, or is it for everyone to see? If you mean to see your game on the 360 then yes. To see your thread in the forums though, they do not need to be your friend. Put details about your game. If you are looking for people for survival, don't just say "Survival looking for players, please add gt below"
Give info about your world, show a map if you have a picture of your seed, show some builds. Ask yourself why would people want to join my survival world over another persons? How do you take screenshots of minecraft on the XBOX 360 and share them on this website? You can press start on your controller. At the bottom of the screen it will say (Y) Press to Share to Facebook. Do that, sign into your facebook account and it will upload an image there. You can save it and upload it to another image hosting website like imgur if you do not wish to link to your facebook page here, or simply use the Upload an Image below the forum's text box to add it to the bottom of your post.